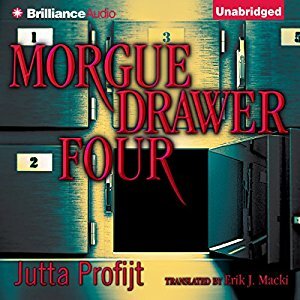 As a finalist for one of Germany’s most prestigious crime novel awards, Morgue Drawer Four could have been…stiff. Dear listeners, it isn’t. Instead we have mild-mannered Martin who likes the solitude of his work as a coroner. One day he performs his customarily precise autopsy on car thief Pascha — and then begins hearing the man’s ghost. First smart-alecky and then downright obnoxious, Pascha wants Martin to get to the bottom of the ‘accident’ that claimed his life. Reader MacLeod Andrews effectively plays up Pascha’s wry, self-absorbed narration as well as the tension of Martin’s out-of-character escapades. Written by Jutta Profijt and translated from German by Eric J. Macki, this odd-couple pairing of reluctant detective and annoyed ghost is a promising pick for those who like action-driven mysteries with a decidedly sarcastic bent.